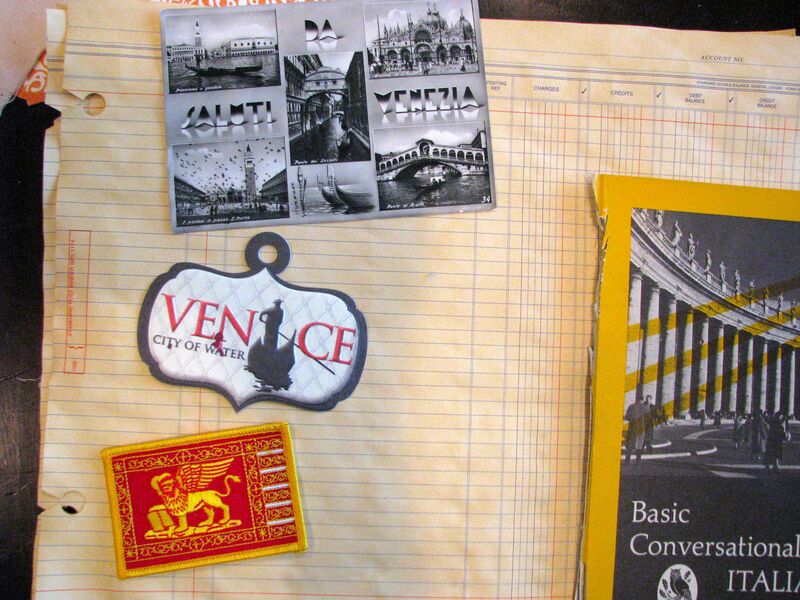 Today I pulled together a collection of ephemera to use in my Ticket To Venice journal. 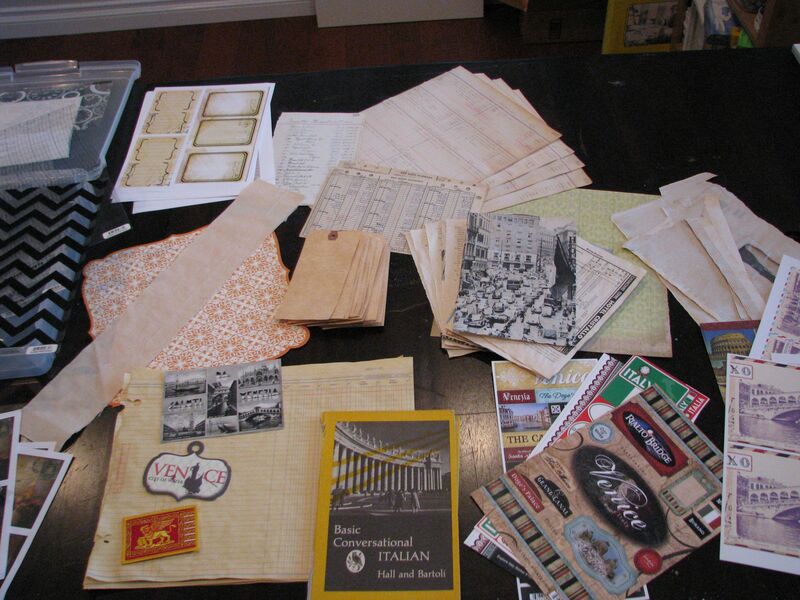 Beginning at the top left and going clockwise, here are the items I have gathered: some Hamly overlays, printed journal cards and tags from the class, old ledger papers, tea dyed book pages, printed postcards from Mary Ann, commercial labels and stickers, book covers (found this at our local Goodwill for $2), an embroidered patch of the Venetian flag, printed Italy digital postcards from an Etsy seller. In the center of the table I have tea dyed a piece of canvas, shipping tags and book pages (from the book I am using for the covers). Here is a close up of the Venetian patch. The postcard at the top is vintage that I had in my huge stash of postcards that I inherited from my great-uncle. The Venice tag in the center I found on-line, I think it was from scrapbooking.com. 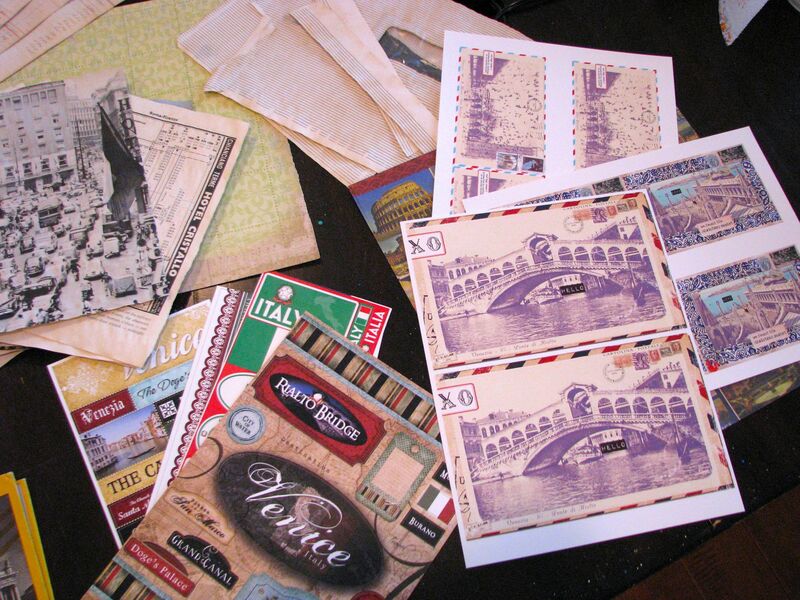 Here are the postcards that Mary Ann has been sending everyday. I printed them out on matte photo paper in different sizes to use throughout the journal. I’m now off to begin the page and signature preparations. Hi Marci — thanks for commenting on my journal page flip. I LOVE your collection of journal fodder. Look forward to seeing your finished journal — I’ve just subscribed to your blog. What a great collection of stuff! Love the top photo! Wow, the Venetian flag is amazing! I don’t think I’ve ever seen it before. Great find!